Triphala is thought to be effective in cleansing and detoxifying the system, especially by regulating the bowels. 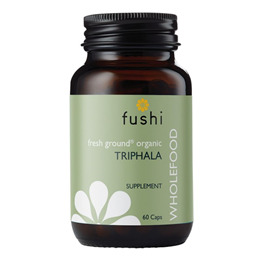 Triphala is the best natural herbal remedy for sluggishness and regulating the whole digestive system. 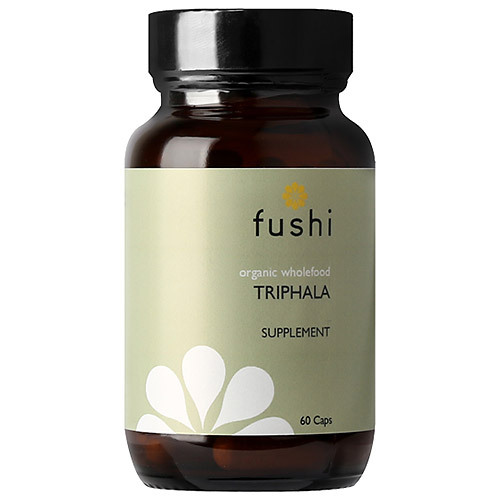 Triphala is an ancient Ayurvedic formulation, translated as three fruits. It consists of the fruits of the amalaki, bibhitaki and haritaki trees. Grown in India it is widely used in Ayurvedic medicine and is most generally used as an overall body tonic. Freshly Ground Triphala - Three Fruits (Amalaki, Bibhitaki and Haritaki), Pullulan Capsules (Aureobasidium pullulans). Below are reviews of Fushi Organic Triphala - 60 Vegicaps by bodykind customers. If you have tried this product we'd love to hear what you think so please leave a review. As someone with digestive issues these are my staple supplement. Have been taking intermittently for years, no side effects. Would not want to be without. A good laxative and it cleans the colon.